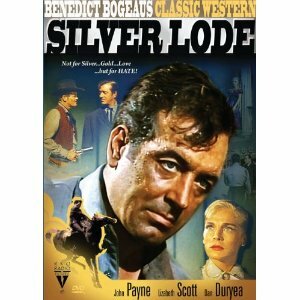 VCI is releasing a Special Edition DVD of SILVER LODE (1954) on May 25, 2010. The movie stars John Payne, Lizabeth Scott, Dan Duryea, Dolores Moran, Alan Hale Jr., Harry Carey Jr., and Emile Meyer. The DVD will feature a restored print and featurettes on John Payne and director Allan Dwan. This film was previously released on DVD in 2002. I'm looking forward to this one. What a great cast! ah...Dan Duryea - I always watch a movie with him.